Three people stand, lit harshly by bright orange light. In the center is Harry Potter: heavyset, hunched over, zir black hair wild. To the right, Luna Lovegood: very thin, with long loose blond hair, with zir wand tucked behind zir ear and an exaggerated expression of interest. On the left, Draco Malfoy: also thin, reserved, with zir arms behind zir back, zir hair short and neat, and zir face slightly flushed. I've been planning Voldemort's Children since September of last year, when I started analyzing the original series from a neurodiversity perspective. 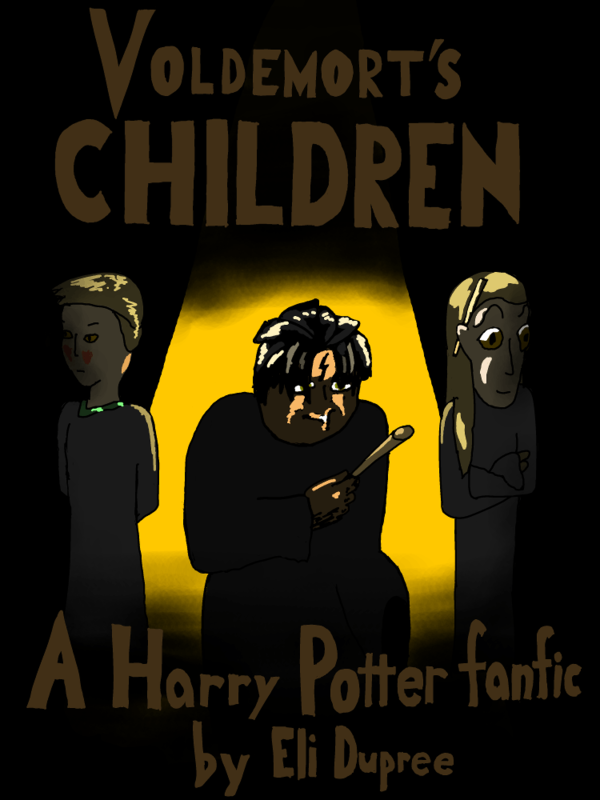 Voldemort's Children is an “Alternate Universe” fanfic - a reimagining of the story in which I explore one possibility of how events could happen in a world where we don't gloss over the implications of neurological difference in general and Harry's abuse as a child in particular. I'm going to leave it at that for the moment, but I'll sometimes use these annotations to talk more about the purpose and structure of the story.